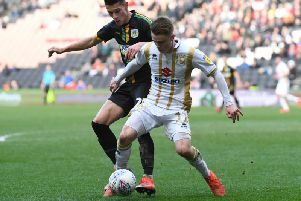 With 11 games remaining, MK Dons are well-placed to mount a strong challenge for automatic promotion. Their 1-0 win over Crawley on Saturday saw them win a fourth consecutive game for the first time since their late-season sprint for automatic promotion to the Championship back in 2015. Sitting fourth, Dons are seven points adrift of leaders Lincoln, while they opened the gap to Exeter City to seven points. After losing seven games from 10 prior to their recent resurgence, had dropped from top to eighth, with their run now giving them hope for the remaining 11 games. While the turnaround shows how quickly the league table can change, it leaves a nagging wonder: where would Dons have been if they had not suffered so badly in January? It is also something which has played on Paul Tisdale's mind. Asked whether he was happy sitting fourth at this stage of the season, he said: "Probably, but things change so quickly. If you'd asked me in November, probably not. But it's all about what happens next. If you lose the ball, it's about how you win it back, if you have a hard day in training, it's about having another good day." While Saturday was not Dons' best day on the field, their win meant they kept pace with the top three, who all won their games too. While earlier in the season, Tisdale said he was not interested in the results of others around them, he admitted now is the time where it will start to play a part. "I'd be lying if I told you it didn't matter, but the priority is what we do," he said. "We're in a position where, if we win the majority of our games, we'll be in with a good chance. "We're getting close – in the last quarter of the season, I'd be lying if I said it didn't make a difference. The major topic is the number of points we get ourselves. We can talk targets, and you can do the same maths I can do, and you have to keep your eye on the ball, but along the way, any result which takes points off our rivals, then great." Asked whether he needs to know during games, he added: "I don't hear a word – but it's good we won too. I'm not interested during the games... maybe during the last game of the season!"